This is my third book of The Adventures of Sophie and Scottie Trilogy. Sophie and Scottie just returned from their second adventure on a remote pacific island and can’t wait for their next journey. Their adventure on Amelia Island was amazing, but it was now time for Sophie and Scottie to return to Shear Heaven Ranch by riding on horseback through their magical frame! As they look to the sky, the sisters could tell that a powerful storm was coming and they needed to use their clever skills to help Ma and Pa during and after the storm. The storm had passed and the summer sun began to dry out the ranch, but who was the boy helping ranch-hand Jack? Whoever he was, the girls knew this kid must never find out about the magical frame, or would he? Sophie and Scottie were ready for their next adventure. Luckily, Auntie Jill’s instructions were simple to follow. But, oh no, their dog Molly ran through the frame before they could go through to a land consisting of snow covered mountains and pine trees! All three find themselves on a boat with their Uncle Drake heading towards a mountain with an enormous rock shaped like a front tooth that was balancing ever so carefully on the mountaintop! Once at their destination called the Colossal Candy Castle, Sophie and Scottie learn that Samuel McSweet lives at the castle but why is he there? Join the girls as they learn how to avoid the largest grizzly bear they’d ever seen and why a bald eagle is constantly watching them. The curious sisters rely on their bravery and wit along with their trusty map to solve the sugary mystery of Sweet Tooth Rock! 50 Great Writers You Should Be Reading 2018 Winner! Homeschooled Sisters Buy These Great Books! 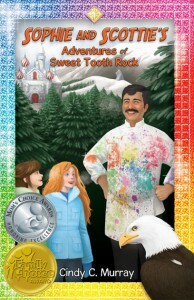 Sophie and Scottie’s Adventures of Sweet Tooth Rock Receives a 5-Star Review!